The Better Bus Project is the first step in our efforts to improve bus service and the system as a whole. It is a key part of our $8 billion modernization work, which includes replacing subway fleets, upgrading tracks, signals, and switches, reinventing our bus system to reflect changing demographics, replacing our fare collection system, and bringing all of our assets to a state of good repair. Too many of our bus routes still fail to live up to our own standards. Through the Better Bus Project, we are changing that. Every day we’re finding new ways to improve the experiences of the people who use and ride our buses. The Better Bus Project has several components: continuous change, analysis, proposed near-term changes, multi-year investment strategy, and the Bus Network Redesign. Continuous change focuses on improvements that can be made when opportunities present themselves. This includes municipal partnerships, pilot projects, and the continuing practice of making regular, quarterly updates to scheduled service to better align schedules with rider demand. 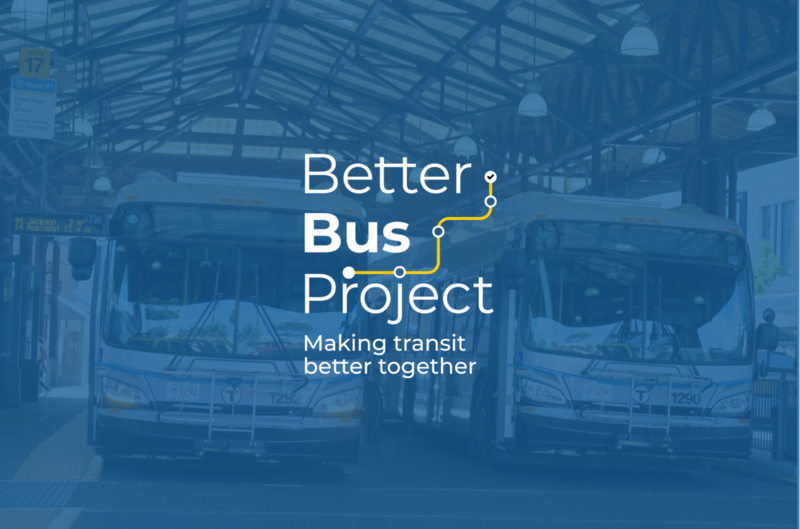 The Better Bus Project team worked with municipalities throughout 2018 to improve the reliability and speed of bus service with bus priority projects in Arlington, Boston, Cambridge, and Everett. As the project continues, we will continue to engage with municipal partners to improve service in other areas. During our analysis period, we reached out to the communities most impacted by gaps in service and schedules. This included discussions at regional public meetings and meetings with community groups and stakeholders, through feedback submitted to our online survey, and by speaking with riders at bus stops and stations. Riders want more frequent, more reliable service. They want more routes that run more often throughout the day—not just during peak service hours. And we learned from planners and operators that there are too many routes, too many complex routes, and too few routes with frequent, all-day service. A review of existing bus service, ridership, and service gaps. An evaluation of the underlying population, employment, and demand for transit in our service area. An excerpt from one of our 47 route proposals. Before we can make substantial service changes, we have to make a few simple changes that will enable better service per dollar invested when it becomes time to to add more buses, drivers, and garages. We have 47 proposals to update and modernize existing routes. These are good, long-overdue changes. Taken together, they’re laying the foundation for a bus network with more frequent, reliable service that provides better connectivity in Greater Boston. The online feedback period closed on March 13, 2019. Thank you for all of your input. We'll take your feedback to the Fiscal and Management Control Board to share with them—whether our proposals were not bold enough or if they went too far or if we missed something entirely. They will then decide if we move forward on a package of revised proposals. If approved, you'll start to see these changes as early as fall 2019. During peak morning and afternoon service, the MBTA bus system runs at full capacity. There are no extra drivers, buses, or space to store extra buses—so we can’t add service somewhere without cutting it somewhere else. This spring, we will engage the Fiscal and Management Control Board in a conversation about additional resources to improve the system. We heard from riders that they want additional resources spent on increasing frequency and reliability, and we will work with our board to understand how we could best spend any potential new resources. We also started looking at redesigning the entire bus network. This Bus Network Redesign will analyze changes to the bus network that will better serve existing riders, and attract new riders, too. We hosted a series of open houses and community meetings during the winter of 2019. Receive the latest project information and find out about public events.